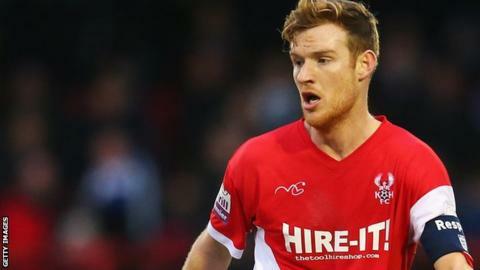 Wrexham midfielder Kyle Storer has joined National League-bound Cheltenham Town on a one-year contract. The 28-year-old made 13 appearances for the Welsh side after arriving from Kidderminster in January. Storer, who has also played for Bedworth Town, Tamworth and Nuneaton, spent three and a half years at Aggborough, playing 141 times. "When I met Kyle I realised how hungry he is to get into the Football League," said Robins manager Gary Johnson. "I've seen games he's played in and he's a leader. He's been captain at previous clubs and is a strong player and a big character so I am pleased he's signed with us." Johnson is staying in charge of the Robins despite their relegation to the National League, the new name for the Conference.